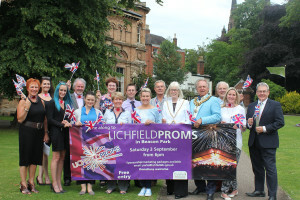 This year’s Lichfield Proms in Beacon Park took place on Saturday 3 September. In spite of the threat of wet weather, thousands of people flocked to the park for the eighteenth free Lichfield Proms in Beacon Park. The sun shone through the clouds as The City of Lichfield Concert Band performed popular classics while the audience found their spaces and set up their picnics. This led up to the main concert, which featured The British Police Symphony Orchestra, its Musical Director and Conductor Richard Jenkinson and professional singers, Claire Prewer, Richard Coxon and Aaron Prewer-Jenkinson. The orchestra’s rousing musical line-up included a 20th Century Fox Fanfare, Hansel & Gretel Overtune as well as film scores from Indiana Jones and the Last Crusade, Raiders of the Lost Ark and Harry Potter. The main concert was expertly compered by proms favourite, Danny Mizon who took the audience through the musical programme and entertained the crowd with his witty humour. A highlight for the evening was a surprise re-enactment from the 4th King’s Own Regiment of Musketeers. Proving a big hit with the audience, the musketeers performed a mock battle between the French and English with musket fire in time to Beethoven’s rarely heard Battle Symphony Opus 91. The rain held off until the fireworks finale which included everybody’s proms favourites, Rule Britannia, Jerusalem and Land of Hope and Glory.